It seems whenever I need to print something for work from my home office all of the paper in the printer has miraculously vanished. It is easy to find though as our refrigerator is covered with all my kids' drawing showing off their latest artistic masterpieces and highlighting where all my copy paper went. 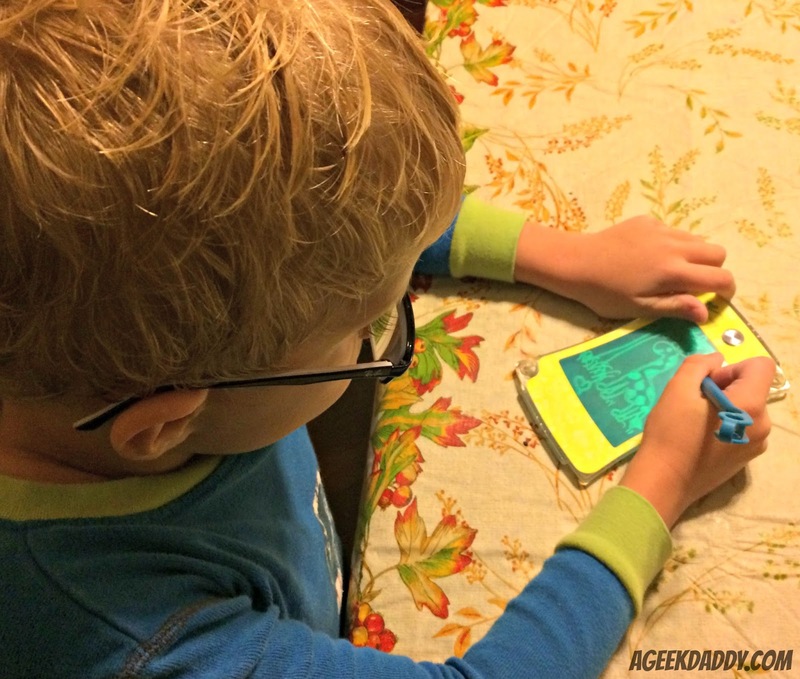 While it is hard to be mad at my kids for having fun drawing it can be quite frustrating. I may have found a solution to my problem though with Boogie Board eWriters! Boogie Board eWriters provide a paper-like writing and drawing experience upon a light weight, reflective, pressure-sensitive, plastic liquid crystal display (LCD). By pressing down on the LCD with a finger, stylus or other instrument images are created on it with the same effect of using a pencil or pen on paper. When you want to change the image simply press an erase button on the ewriter and an electric field generated by a coin cell watch battery that powers the device will make it vanish. The only energy the device uses is to wipe the LCD screen clean so you can get a lot of use out of it with a small battery while also being very environmentally friendly by reducing the amount of paper you use. 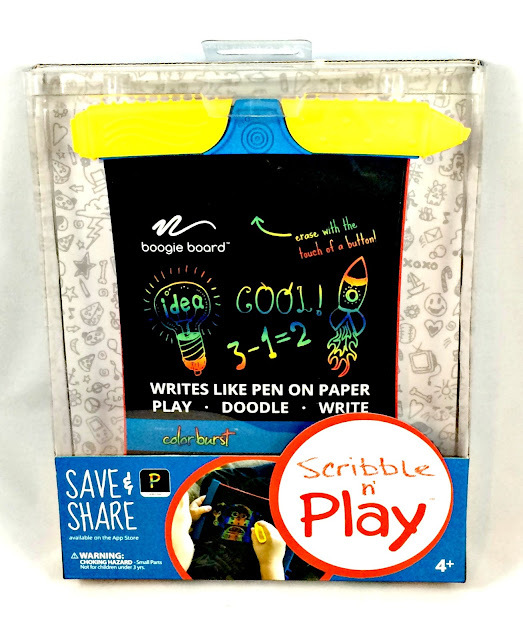 Boogie Board eWriters can serve as a multi-purpose paper replacement for helping students practice handwriting and arithmetic, taking notes, leaving messages, creating maps, playing games like Tic Tac Toe, even diagramming sports plays for a youth basketball team you may be coaching. Oh and of course these devices are great for drawing pictures! 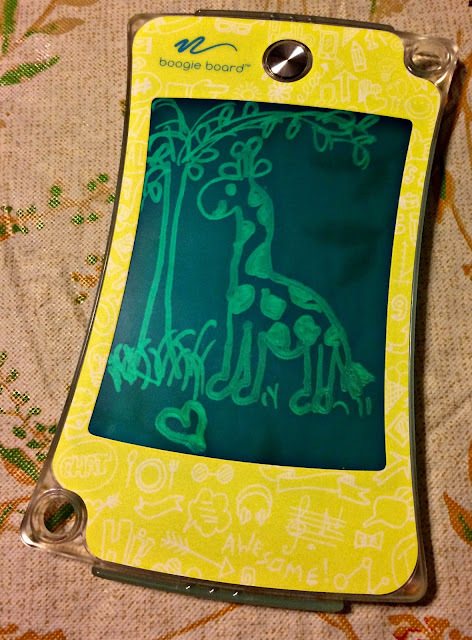 The sky is the limit for applications and pretty much anything you write or draw on paper can also be done on a Boogie Board eWriter. It sounds almost too good to be true, but my family has put two of their models to the test, a Scribble n' Play and the jot 4.5 CLEARVIEW eWriter, and both performed splendidly. My daughter loves doodling on the Scribble n' Play and I've noticed that the paper in my printer tray hasn't been disappearing as much. 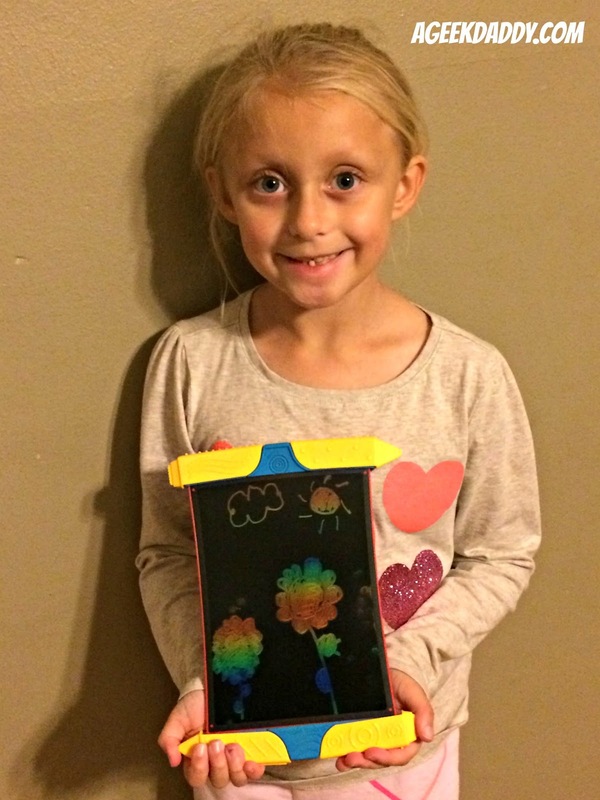 She really adores drawing on her Scribble n' Play. This eWriter features Colorburst technology that provides a multi-color LCD writing screen. It comes with four stylus tools that allow users to create a variety of lines and textures to enhance their drawings. These stylus attach to the board for easy storage. a FREE app for iOS devices allows you to save your Scribble n' Play creations on a phone or tablet then share it with family and friends. With the simple push of a button the image on the LCD disappears and you can start on a new masterpiece. Since the energy you need to operate the device is primarily to generate an electrical charge to reset the LCD it has really long life with the battery it comes with and when it is time for a new one you just need to pick up a replacement coin cell battery. 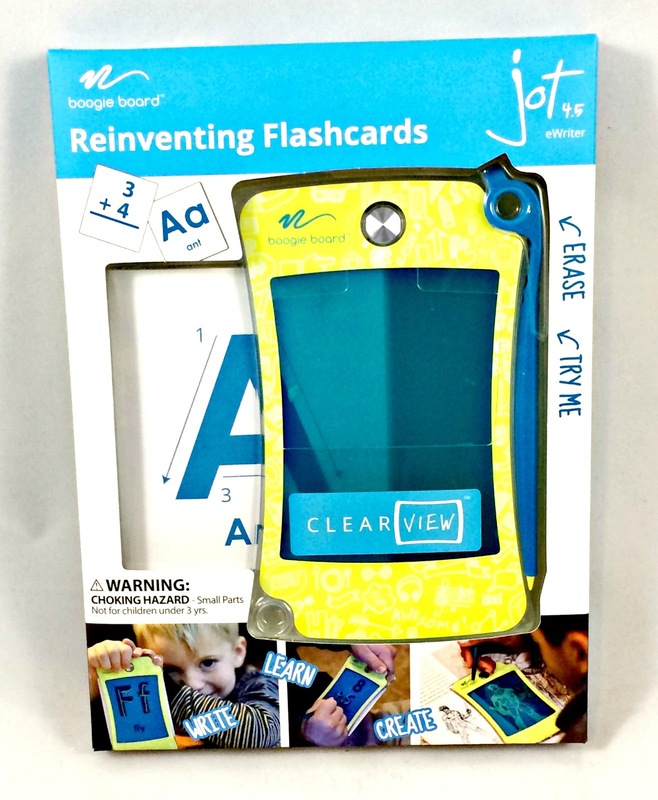 The jot 4.5 eWriter has a patented translucent LCD screen that makes it perfect for kids to practice writing their numbers and letters. It comes with alphabet flashcards that can be placed behind the device for kids to practice their handwriting skills. There is also a FREE iOS app that provides practice math drills that can be placed under the eWriter's clearview screen for kids to interact with using the device's included stylus. The jot 4.5 eWriter's quick, one-push of the button erase system makes it great for repetitive tracing and memorization drills that would be particularly useful for students in kindergarten through third grade. 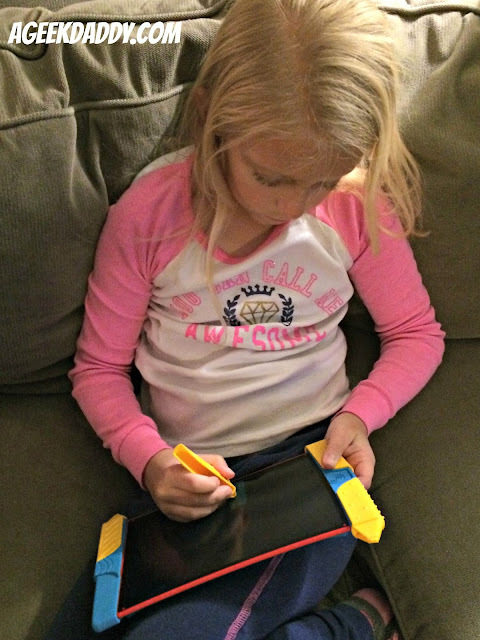 This device isn't just for tracing though and while it is great for young students there are plenty of practical and fun uses for adults too. Use it to write down things you'd otherwise need paper, scratch pads or sticky notes for. It's also great for sketching! In addition to using the included flashcards to practice his handwriting on the jot 4.5 eWriter, my son also has lots of fun drawing on the device. Trace an illustration or if you have the artistic ability create your own work of art draw something freehand. 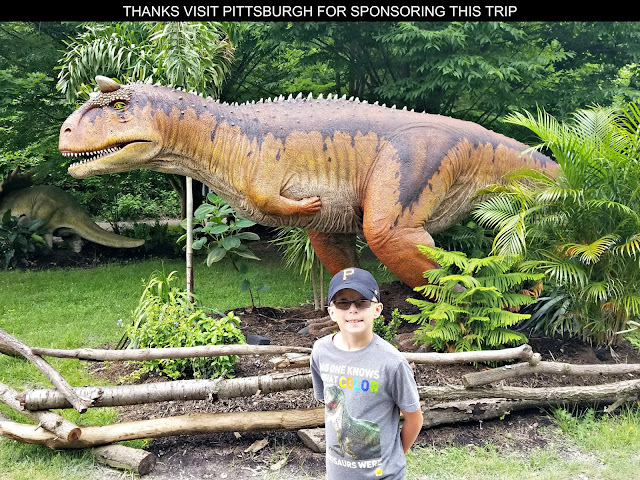 Affordable, convenient, practical and environmentally friendly, our family has had a great experience using Boogie Board eWriters. I particularly like these devices get away from typing and encourage people to continue using handwriting. 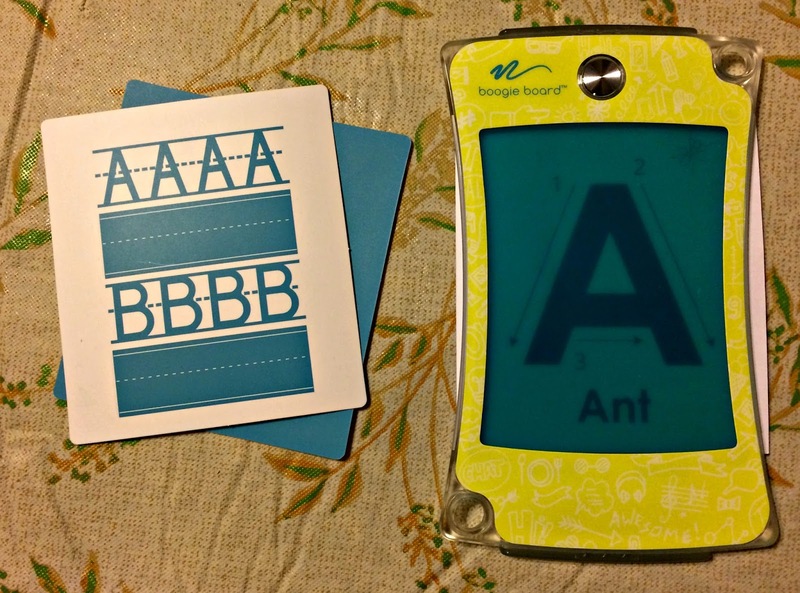 The two devices we reviewed are focused on being primarily used by children but if you really appreciate this concept, Boogie Boards also has an eWriter aimed for adults, the jot 8.5, that features a sync app that easily transfers your content in a format that can be edited to a phone or tablet encouraging using the device for note taking, writing, and messages. Awesome write up on Boogie - Boogie down with Boogie as they are super cool like you! 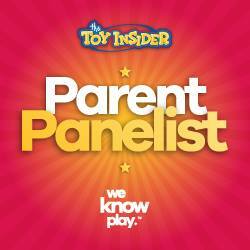 Always love your reviews Geek Dad as you take the risk out of so many of my purchases for my kids. Thanks!